I guess I got interrupted when I was about to post these photos of our June SOTM a couple weeks ago... sorry about that! This months stamp is a gorgeous duo of flowers from Magenta! Here are some more sample cards featuring a funky accordian fold- the first was done by our sales rep, Jacqueline and the second was inspired by it (created by Tracey). 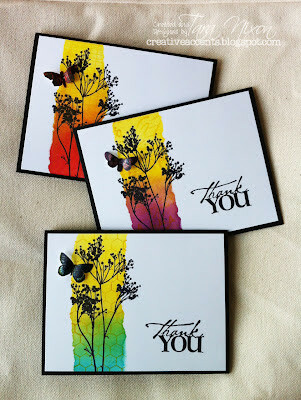 We'll be doing something very similar to this in our Alcohol Inks class- which has been scheduled for July 7 at 6:30pm. Email us if you're interested in joining it!